One of my most popular posts has been a Hand Pruner Showdown in which I compared and contrasted Felcos, Coronas, and Bahcos. One of the first comments on that post was a Fiskars fan, saying essentially – “OMG! Try the Fiskars pruners – they’re inexpensive AND ergonomic”. And so they are! Now that I’ve tried them for myself, I’m shocked at how much I have been enjoying them. As a professional landscaper, ergonomics are incredibly important to me. I want to be able to garden for years to come with no pain or injuries, and the Fiskars PowerGear Pruner has a wonderful fat grip that is very comfortable to use. I’ve never been a fan of rolling handles on a pruner, because the handles on some brands are hard to grip and get into position. The Fiskars are the first pair that actually felt comfortable to me right away. The rolling handles are meant to help our hands bend in a natural way when pruning, and these pruners have actually gotten approved by the Arthritis Foundation for being easy on the hands. I’m already a fan of the metal that Fiskars uses on their blades and the special non-stick coating that lets the blade make cleaner cuts – I’ve been using the Fiskars PowerGear Hedgers for years – so I was happy to see it on these pruners. The only improvements I’d recommend to these pruners are a wire-cutter included on the blade, and a sap groove to help divert sap from the moving parts and keep them from sticking together. Anyway, Fiskars was kind enough to provide two pairs to give away, so if you want to try one of these bad boys out for yourself, you know what to do: leave a comment here and over at Garden Rant and we’ll each choose a winner next week. Good luck! EDIT: Ms Green Jeans is the winner of the PowerGear Pruners! Congratulations, Ms Green Jeans! Your pruners will be on their way shortly. And if you want to get to know the nice people at Fiskars, check out their Facebook page and Twitter stream. Always looking for new pruners! Thanks for the review. hmm…..I wonder if these were the pruners my husband put in our cart at Lowe’s this week and I took out and put back because I wanted to look for a review…..he’s an impulse shopper, I research everything to the nth degree! Anyhow thanks for the review and the either post as well….in the market for new pruners! 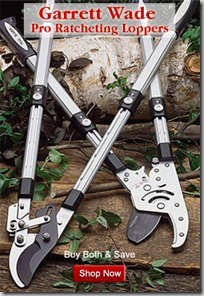 I would love to have the Fiskars Power Gear pruners. I still have the pruners I bought when I started gardening five or six years ago (don’t remember what brand) and they are awful. 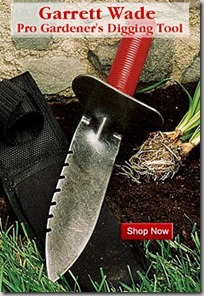 I would love to have something that would make pruning fun. I’ve dealt with carpal tunnel syndrome in both hands in the past. Don’t know why, but I’ve never tried pruners like those. They would probably help ease the pain in my hands at the end of a long pruning session. Thanks for the review! Always look forward to hearing your thoughts! I had a pair of those. Loved them, but they disappeared in my garden somewhere. Since I’ve moved, I don’t expect to find them again. Fun review, and I went back and read the review on other hand pruners. Now I want another new pair. I would love to try these. Thanks for the review. I have these (& carpal tunnel syndrome) – I love them ! My Father-in-law has arthritis. Gave him a pair & he loves them, too. I would so love to win these pruners. I would love to try these! I just pruned all of my grapevines, berries and fruit trees with cheap ones where the handles have fallen off! Not comfy. I’ll go to my grave holding a pair of Felcos. Fiskars will be left out in the dirt. They sound awesome! I’d love a pair. Power pruners need power pruners! Maybe the consolation prize is power prunes. Thanks for the review, I can use some new pruners!